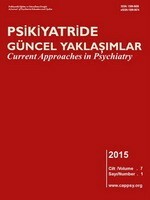 Psikiyatride Güncel Yaklaşımlar / Current Approaches in Psychiatry is an online peer reviewed bilingual journal aiming to publish updated current review articles on all aspects of psychiatry and related sciences (i.e behavioral sciences, psychology, psychopharmacology, neuropsychiatry, neurosciences, psychiatric nursing) in Turkish or English. The journal accepts articles on not only current subjects but also on classical subjects to become an educational source for all psychiatric residents, specialists and related professionals. Journal also publishes a special issue which includes only research papers in every volume. Psikiyatride Güncel Yaklaşımlar / Current Approaches in Psychiatry is an online peer reviewed bilingual journal aiming to publish updated current review articles on all aspects of psychiatry and related sciences (i.e behavioral sciences, psychology, psychopharmacology, neuropsychiatry, neurosciences, psychiatric nursing) in Turkish or English. The journal accepts articles on not only current subjects but also on classical subjects to become an educational source for all psychiatric residents, specialists and related professionals. The journal accepts articles on not only current subjects but also on classical subjects to become an educational source for all psychiatric residents, specialists and related professionals. Journal also publishes a special issue which includes only research papers in every volume.